ETIAM Nexus is a Web application used to manage outside exams. These exams are imported from CD/DVD through ETIAM Viewer or sent directly and securely from outside institutions using ETIAM-Connect and its Secure Medical Networking technology. Today, most outside images—including these CDs, which are transformed into electronic images at the Desks, and exams sent electronically from other facilities directly to the Radiology Department—enter the PACS through an ETIAM Nexus device located in the central PACS Film Library. ETIAM Nexus runs as a central appliance over the hospital intranet and all users are authenticated for security. The server automates many aspects of the exam reconciliation process, while specially trained technologists perform the most sophisticated changes, as the image enters the PACS. ETIAM Nexus supports all the varied workflows required for images from the multiple sources involved and allows the fine-tuning of information that enables Cleveland Clinic to manage images their way—easily, cost-effectively and accurately. 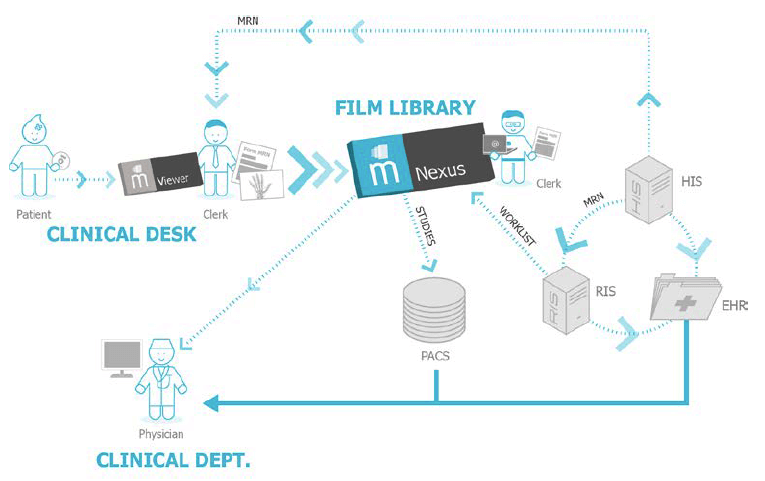 At the Film Library, the ETIAM Nexus server efficiently processes all exams to ensure they are accepted by the PACS quickly and precisely.